1. 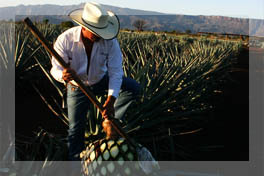 Tequila elaboration begins with the agave growing as set forth in the Appellation of Origin Tequila or DOT. First task is to select the hijuelos*, baby agave offshoots that grow from the base of mature Agave Tequilana Weber, blue variety, which are replanted at the DOT area only. This is the area protected by the Declaration for the Protection of Appellation of Origin Tequila. Those 19 inches approximate height offshoots shall be free from diseases. 2. It may take ten years approximately for the plant to reach its peak ripeness. After this term the plant is capable of providing the best honeys and is ready for the jima. 3. The “Jima” consists in cutting off the leaves of the plant down to its base, to keep only the head or heart of agave. 4. Production process begins with agave heads baking and mashing. Baking is done by water steam pressure, either in traditional masonry ovens or autoclaves. Baking time in masonry furnace is 48 hours while 12 hours in autoclave. The purpose of this stage is to convert inulin (agave sugar) into sugars such as fructose and sucrose, which are readily fermentable. 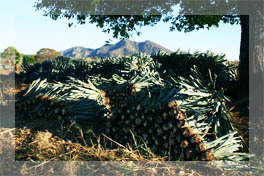 At the end of cooking, the baked agave is transported to mills where it is cut into a few inches pieces. 5. Extraction of honeys and pulp after the agave heads were shredded. Water pressure is applied on baked agave heads after these were mashed to extract the sweetness and then squeeze in conveyor belts. 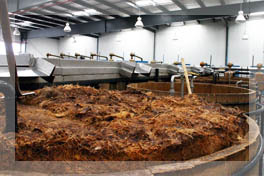 The honeys are then separated to continue the manufacturing process, while the pulp is discarded. The honeys extracted from baked agave heads are captured in tanks. They are then transported by pipeline to the tubs of formulation for Tequila production or for 100% agave Tequila fermentation, as the case may be. 6. Formulation consists of mixing the 51% agave sweetness minimum, with a preparation of no more than 49% percent of other honeys, (standard sugar, brown sugar, glucose, fructose, molasses, etc.) and then these are fermented. 7. Fermentation is one of the most important stages of the process. In this stage the sugars are transformed into ethyl alcohol and others in smaller proportions. Fermentation is performed in big stainless steel containers and honeys, also known as must, are added. Then water, yeasts and nutrients for fermentation are added. Fermentation time varies depending on environmental temperature and this, in turn, changes with each season. Under low winter temperatures, fermentation can be prolonged more than 24 hours. This process has a pattern similar to any organism development curve, representing firstly an exponential growth, then a second lineal phase and a late-stage decrease. 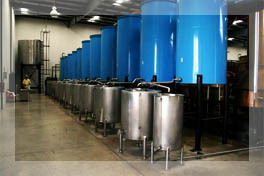 Any product fermentation implies alcohol, carbon dioxide, water and energy released as heat. Must in plain fermentation is effervescent and motion ceases when yeast cells finish work. At that time the process ends and it is customary to say that must is dead; yeast has completed the sugar conversion into alcohol. 8. During distillation process, heat and pressure is applied, separating the enzymes in alcohol content products (Tequila) and vinasse; being the latter a waste product. Process is carried out in copper or stainless steel stills, and even in continuous distillation towers. Common stills consist of three parts: the pot or boiler, where must is deposited for heating; the column or capital, which collects and conducts the steams, and the coil, where the steams are cooled becoming liquid. Boiling points of the different compounds and the diverse volumes and pressures of the still assist in the gases separation, and these are condensed into higher alcoholic content products. 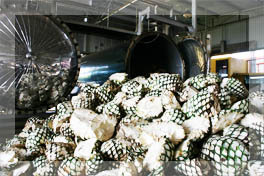 Two distillation processes are needed to produce Tequila: the first is called crushing and the second rectification. Matured and bottled as Ultra Aged Tequila. The Tequila bottler must demonstrate, at all times, that the product has not been altered since it was delivered in bulk until final bottling thereof. Tequila should be bottled in medical type new containers, safe and made with materials resistant to the different stages of the process, so they do not react with the product or alter its physical, chemical and sensory features. Each container capacity cannot exceed 1,320 gallons (5 liters) and in no case can use containers with brands that are not owned by the producer or packer approved under terms of this NOM draft. m) Any other information as required by other legal provisions applicable to alcoholic beverages.